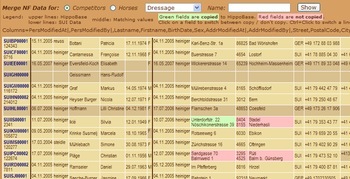 In summer 2007, HippoBase will be extended by an import interface for competitors and horses. If the national-ID or FEI-ID of a record does not yet exist in HippoBase it can be added. Where one of the IDs matches an existing record in HippoBase this record can be updated individually with national data as can be seen in the picture. Later it will also be possible to extract changes from HippoBase to update a national database. Combined, these features will allow a complete two-way synchronisation between HippoBase and an existing national IT landscape. However, national federations will have to determine how to extract an internationally used subset of their potentially very large stock of competitors and horses.